This month for my SRC reveal, I was assigned one of my long time favorite blogs, Baking and Boys by Katrina. Ever since I started blogging back in September 2010, when I joined some awesome bloggers for the 12 Weeks of Christmas Cookies Challenge, I have been a big fan and follower of Katrina's blog. She always, ALWAYS, posts some absolutely delicious treats. Everytime, I visit her blog, I find myself wishing I lived next door to her, that way I might've been able to sample some of them (much easier than making them myself ;) ). She has so many options for Chocolate Chip Cookies, I almost made a batch. But realized that I had just picked up a bag of chocolate chip cookies on impulse just before the assignments got out. I pretty much stuck to Katrina's recipe and added all the optional add-ins. The only difference being, I used almond meal instead of whole almonds since I had it at hand. 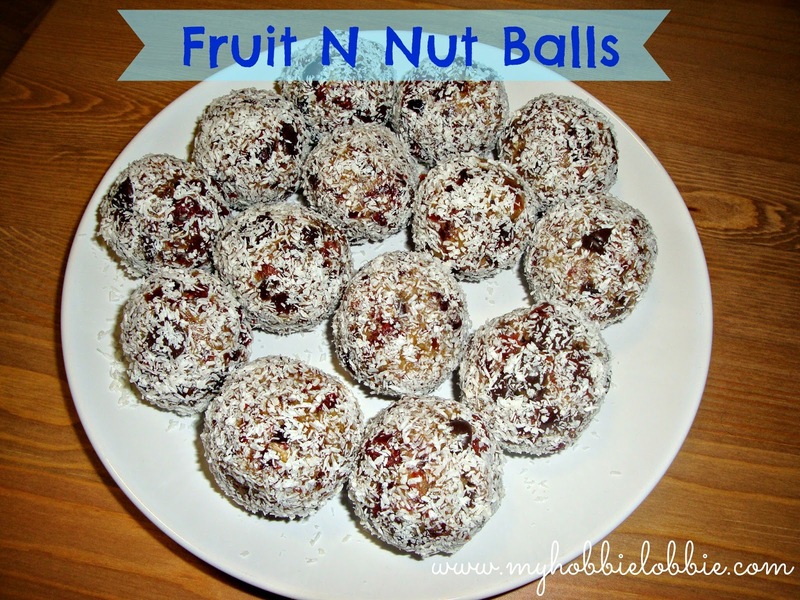 Also, instead of mixing the coconut with the rest of the ingredients, I just rolled the little fruit and nut balls in it. I love the fact that these have no sugar in it and everything in it is wholesome. In my books, that makes it a healthy snack. With the cranberry peeking out from under that snowy looking coconut, these remind me of Christmas :) I think it would look pretty on a platter of Christmas treats. These are slightly on the larger side and are snack sized, but when I make them next, I intend making them a little smaller. Chop up the dates roughly. Put the dates, cranberries and almond meal into a food processor and blitz till it chops everything up nice and fine and mixes it through. Add the honey, vanilla and salt and pulse it to bring everything together. At this stage it will start to clump a little. Add the chocolate chips and pulse it a couple of times to mix it through. Divide the dough into walnut sized portions and roll to form balls. Place the coconut in a small bowl or plate and roll the balls in the desiccated coconut. Leave it to set for a little while. Store in an airtight container. I thought so too :) Thanks for stopping by!